The following is a list of known routers and modems which we have determined to be compatible, incompatible or compatible with changes to the configuration of the device. We have also provided a list of devices which we are aware of but have not yet tested ourselves. Cloud-based VoIP services rely heavily on router dependability—as this is the device that handles all connections between your network and Jive Cloud. It is imperative that your organization uses an approved and properly-configured router. After years of experience and testing, Jive can make recommendations as to which routers work best. If you have any concerns about the compatibility or quality of your router, please contact Customer Support for additional assistance. 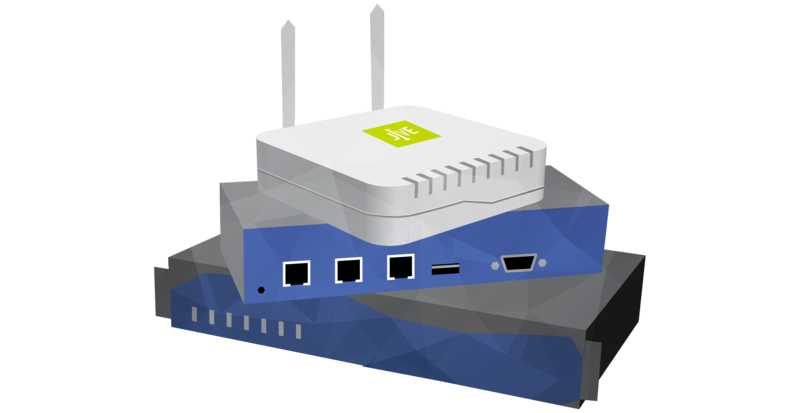 Recommended routers can be purchased pre-configured directly from Jive. * This router must be purchased from Jive. ** Larger offices with more than 25 users should receive a unique recommendation from Jive’s Engineering Team based on individual usage requirements. Your Sales Rep or Project Manager can help facilitate this communication. Do I have to use a Jive recommended router? No, of course not. Most enterprise routers/firewalls will work as long as they can be configured to allow the type and number of connections that VoIP phones require. These recommended routers simply take the guesswork out of the picture because we know they work with Jive. Do I have to purchase my router from Jive? No, however, if you need to purchase a router to support your new VoIP system, we recommend getting it from us. Routers purchased from Jive arrive pre-configured ready to use and enable us to provide continual support for maintaining the functionality of your phone system. Routers purchased elsewhere can still work with Jive and we would be happy to help you get up and running. The possible drawback is that our support may be hindered due lack of support from the manufacturer/vendor firmware or limited feature packs, etc. What constitutes a “recommended” router? After years of experience, testing, and supporting numerous customers with network configurations, we have learned a lot. To put it simply, they just work; and as a result, we can confidently recommend them. Why does Jive recommend Adtran routers? 1. They are enterprise-grade, but affordable. 2. They are a well-known brand in the telecommunications industry. – QoS implementation is extremely elegant. – VoIP reporting features, SIP proxy capability, etc. – Home-grade routers from D-Link and Netgear are suitable for 1-4 users with minor setting adjustments. – Modem/Router combo devices or DSL/Cable Gateways (typically supplied by your ISP) are suitable for 1-4 users, but are not recommended. Set these devices to Bridge Mode and use a separate router for optimal results. What is a blacklisted router? These are routers that we know will not work with our platform. We strongly recommend acquiring a new router/firewall before using Jive’s services. What would cause a router to be blacklisted? – SIP ALG enabled by default and cannot be disabled. – Pruning or dropping UDP sessions too aggressively and no way to change/modify that. – Issues with SIP and/or NAT Overload in general. If my router is not on the list, will it work with Jive? Likely yes — especially if it is an enterprise-grade router. However, unless it is a Jive recommended router, it is hard to definitively say for sure. Feel free to contact us and we can confirm whether or not your router can support VoIP. My router is on the list, what should I do? Contact our Sales Department or your Onboarding Specialist to acquire a Jive recommended router. Will My Existing Router Work with Jive? – Consumer or SOHO (Small Office/Home Office) routers for anything other than a very small handful of phones. Keep in mind that if there are any issues with your existing router, Jive will be limited in the assistance we are able to provide (though not for a lack of trying) and may suggest the purchase of one of our recommended routers. Purchasing from Jive will allow us to pre-configure and support that device directly as it pertains to your phone system.